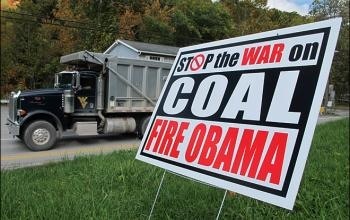 Sadly the only war where our president doesn't lead from behind is the "war on coal." This war is having a devastating affect on segments of our economy as coal fired plants and coal mines are closing thanks to Obama policy. Don't despair because after destroying their careers, Uncle Barack is going to send them money. According to the Environmental Protection Agency’s (EPA) own estimates, its proposed power plant regulation could eliminate one-fifth of existing coal generation facilities and 80,000 energy jobs. The regulation, set for final publication this summer, would regulate emissions at existing coal and natural gas power plants, while also ensuring that consumers use less energy from coal facilities. Based on American Action Forum (AAF) research, this means that more than 90 coal-fired power plants could be retired across the country. Secondary employment impacts suggest that EPA’s power plant regulation could eliminate 296,000 jobs, about the population of Cincinnati, Ohio and more than the total number of jobs the economy created in February 2015. The grant is being made available as part of the Partnerships for Opportunity and Workforce and Economic Revitalization initiative — known as POWER — led by the Commerce Department's Economic Development Agency. That's cute, get it? They destroy the coal industry and call the program to help the people whose jobs they killed--POWER. Gee the Obama administration is so clever. "Recent changes in the energy economy have had a profound impact on Appalachian families and communities that have been sustained by the coal industry for generations," said U.S. Secretary of Labor Thomas E. Perez announcing the grant at the Shaping Our Appalachian Region Strategy Summit 2015, in Pikeville, Ky. "We have a moral imperative to work together to ensure we all succeed. That's what the POWER initiative is all about — developing truly cohesive relationships at the federal, state and local level to create real economic opportunities for families throughout the region." Opened today, the Federal Funding Opportunity outlines the POWER Initiative implementation grant priorities, evaluation factors, and application guidance for the up to $20 million from Department of Labor, up to $12.5 million in funding from the Department of Commerce, up to $2.5 million from the Small Business Administration, and up to $500,000 from Appalachian Regional Commission. Grants will take a comprehensive approach towards economic diversification and worker advancement in implementing their economic development strategic plans. Experience shows that projects which integrate both economic development and workforce development solutions with broad community partnerships are more successful than when independent solutions are pursued. I have a much better idea. Stop the War on Coal, reopen the plants and give these people their jobs back--it's cheaper and much more efficient. But that wouldn't fit Obama's progressive agenda.